The Sutra Teaching the Four Qualities speaks of the Four Powers in the following way: Maitreya! If bodhisattva mahasattvas have found these four things they will overcome evils that have been committed and established. What are these four? They are (1) the power of the thorough application of total remorse, (2) the power of thoroughly applying the remedy, (3) the power of renouncing harmful acts, and (4) the power of the support. 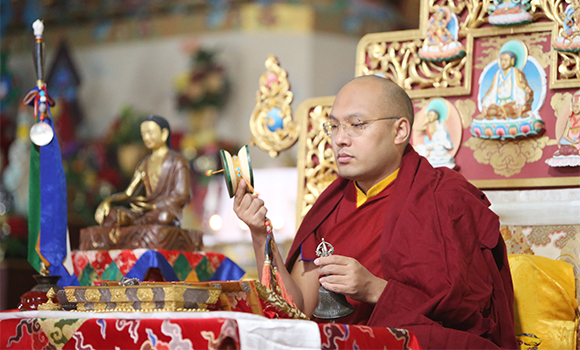 Today, His Holiness the Karmapa continued the teachings from yesterday’s topic on confessing one’s misdeeds, specifically focusing on two of the Four Powers. Reading through the transmission of Gampopa’s Ornament of Precious Liberation, which today covered the first power of remorse and its three divisions, the Karmapa took up the question asked in the text, “How do we stimulate the power of remorse?” In sum there are three ways: by considering the pointlessness of one’s wrongs, by considering fear, and by considering the urgent need for purification. The discussion today focused primarily on these points. “We need to confess all of our misdeeds from beginningless samsara, not just one or two of them,” the Karmapa said. However, it is important not to be overwhelmed by thinking of all the misdeeds we have done as it will prevent us from taking action. “If you simply become depressed by contemplating your misdeeds, thinking, ‘I am not a worthy person,’ this is not very beneficial.” His Holiness explained, “Actually, from one perspective, [giving rise to these thoughts] is very good.” When one contemplates all, or even one, of the misdeeds one has done in this or previous lives, that recognition becomes the starting point to be able to purify it. We should confess our past wrongs with all Four Powers, he said: “The Four Powers are like the four pillars of a house.” When all four are used, the confession is more potent. Of the Four Powers, remorse and the resolve not to do it again are the two most important ones. Of these two, “Remorse is even more important,” the Karmapa said, because “the resolve not to do it again is dependent upon feeling remorse.” When one feels remorse for the wrongs they have done, it is easier to have the resolve not to do it again. Regarding the wrongs that we have done, the main point, the Karmapa said, is to separate the actions from the person that committed them. There is no need to think “I am a bad person.” It is important to recognize it was the action that was harmful, and not to consider a person to be completely bad or evil due to what they have done. There is no need to feel guilty or hopeless. The point of recalling our past wrongs is to “increase our inspiration, to increase our hope.” When we have done something wrong, the Karmapa explained, it is similar to the moon with clouds—it is not that the moon has gone black; rather, it is a temporary condition when the moon has been hidden by clouds. We at times also become obscured by “temporary adventitious conditions;” however, by confessing what we have done and recognizing it as wrong, we can again shine forth. “It is important to distinguish between the person and the act,” His Holiness reiterated. “It does not fit with the Dharma to call someone a bad person. [We have to realize] that person was not at fault, but under control of their afflictions.” We ourselves, as well as other individuals, are similar to the moon that has been obscured by clouds. Once the clouds of the afflictions have been cleared away, our brightness is apparent again. Another piece of helpful advice that the Karmapa gave, was regarding the times when we have doubts about whether we can give up certain misdeeds or not. “We need to make a distinction between the wish to resolve and refrain from something and actually being able to do so.” Making the heartfelt aspiration to stop committing bad deeds, is beneficial, even if at times, one is unable to keep that promise. His Holiness explained: “If the wise commit even a large misdeed, it can be purified or diminished. But for an ignorant person who does not know how [to confess and purify their misdeeds], even a small misdeed will grow larger.” From the Karmapa’s teaching today, we learn the immense value there is in contemplating our past wrongs and misdeeds. Attempting to resolve never to do them again has great power and benefit, even if one is not always successful. Making the effort to resolve is better than not attempting at all.